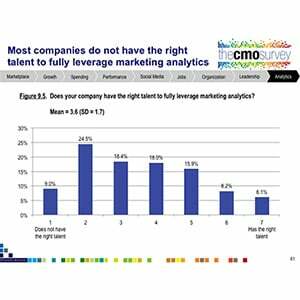 The latest edition of The CMO Survey, from the Fuqua School of Business at Duke, has arrived, and there are some implications for social media marketers worth noting. First of all, the study is solid–while it is based on a self-selected sample of about 400 marketers (88% of which are at least VP level), the sampling has been consistent since 2009, and as we always say in my business, the trend is your friend. Now, there’s been some ink spilled about the 18.1% figure provided as a five-year projection, but let’s face it–it’s optimism, and not an actual expenditure, that is being measured here. Five years ago, WhatsApp wasn’t a 19 billion dollar company, so I’m not sure many of us can predict what 2019 looks like. According to these marketers, they are planning to increase their spending on something that they aren’t even sure “works,” at least in the financial sense (and, is there any other sense?). Given that half of the sample has no idea what the impact of social is (and, to be fair, we don’t have the data to show the projected social media expenditures from that half), what do we think is going on here? Why are so many marketers plowing more money into something that might not even work? Again, the sampling for this study has been consistent since February, 2009, so to my eye, this trend is legit in terms of these marketers. That’s the highest level of optimism yet recorded in 11 iterations of The CMO Survey, so there’s certainly a rising tide lifting some boats–and social may be one of those boats. 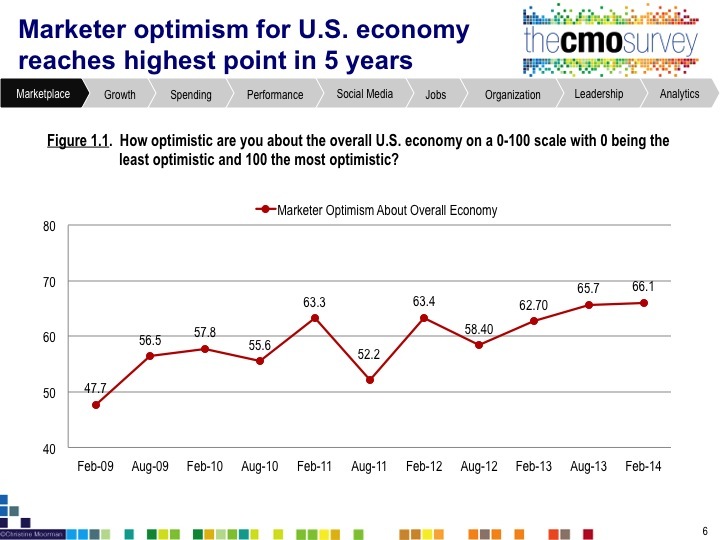 And marketers are more likely to be experimental in good times than in bad. 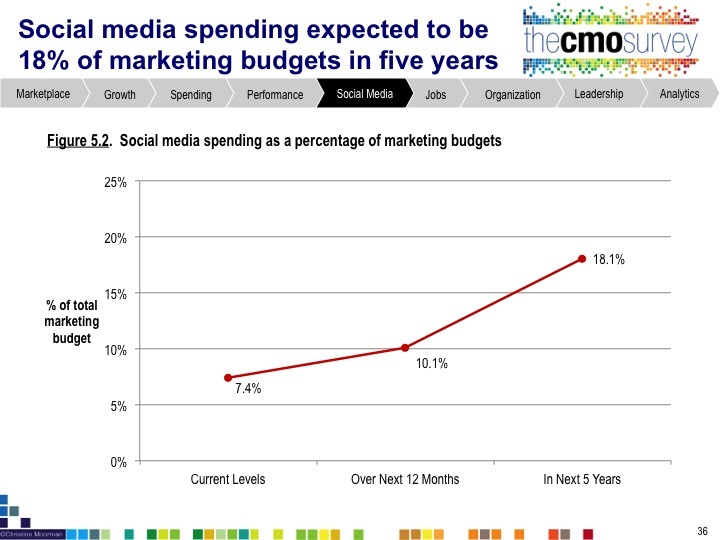 This means, of course, given the year-to-year fluctuations in this kind of optimism, that social media marketers have the next 12 months to get their analytics houses in order before the next downtick in optimism results in a potentially concurrent downtick in social media marketing budgets. And it isn’t their fault. 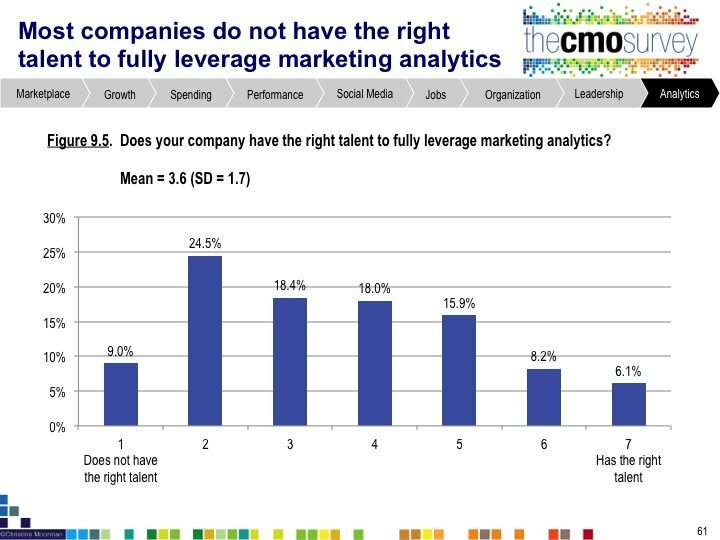 There is very clearly a shortage of analytics talent available to marketers (as another graph in this survey shows) in an era where the amount of data to which they have access has multiplied exponentially. It’s as if Silicon Valley just flooded, and there’s only one Aquaman. All of which is to say this: if you are in the business of using social for your marketing efforts, either on the brand-side or the agency-side, now is a great time to dig those wells before you get thirsty. Use those extra dollars, and that extra optimism, to build analytics and pre/post campaign measurement into everything you do and to recruit or develop tomorrow’s analysts. 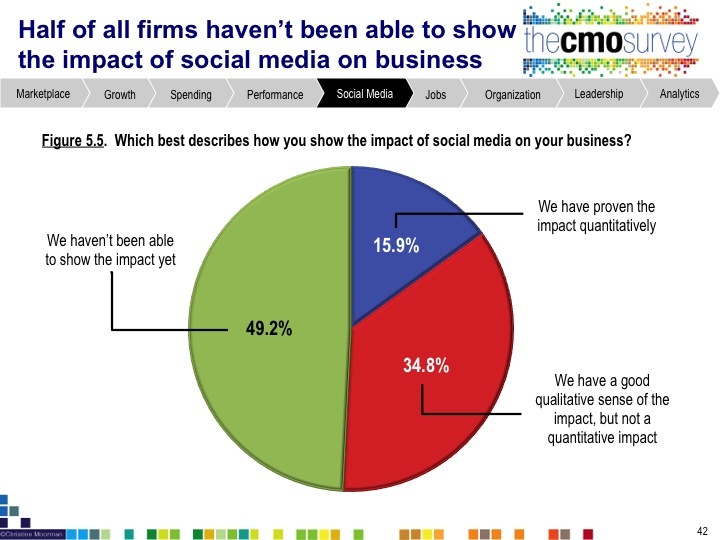 End 2014 with more actionable insight and knowledge about the impact of social on your business than you have today. Hold your efforts to the highest possible standards–and let Darwin take care of the rest. Only then will your 2019 look like the line on that first graph.